MCC Won convincingly by some 250 runs. 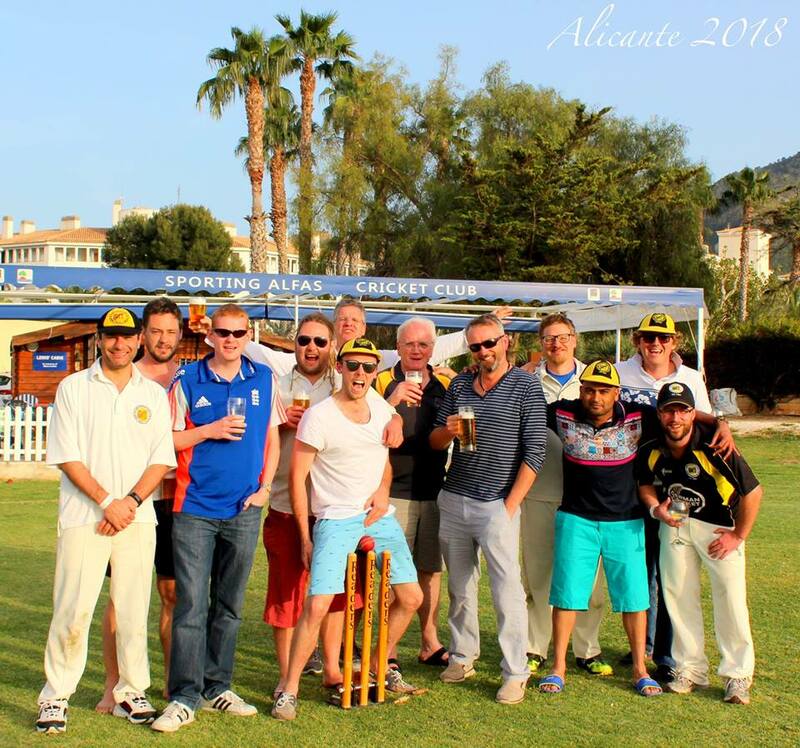 Saturday 8th May and back to the Hirschanger for the first league game of the season against the Punjab CC. They had beaten us in a friendly last season, winning the match in an unusual way when Miller took an outstanding catch in the outfield then carried it over the boundary for a six in his celebrations. Still it really was a superb catch Scott. Weston used the large breasted Maria Theresa silver dollar and duly won the toss choosing to bat. Lovell and Weston opened for MCC and after seven overs and some very tight bowling MCC were 16 for 0. With bowling changes the situation changed drastically and the score progressed rapidly for the rest of the match. Lovell proved he had learnt the lesson of diving in to save his wicket and the evil tongues who claimed it caused Eyjafjallajoekull to shudder again are completely out of line. Unfortunately for Lovell he then got out to a Jayasuriya – the ball skimming the bowlers fingers and going on to break the wicket when the batsman is backing up – and was run out for 31 with the score on 87 in the 16th over. Sarma now came to the wicket and together with Weston put on 237 for the second wicket, being out caught on the final ball of the innings going for another big one. The partnership was the highest for the second wicket and eclipsed the 150* set up by McAlpine and Scanlan back in 1991 against NAMMA. It is in fact the highest partnership for any wicket in the history of the club and the final score of 324 for 2 after 40 overs is the third highest MCC score ever, the others being 336 against Pak Orient in the league in 1998, 327 against Freundeskreis Sri Lanka in the league in 1998 and 327 against the Old Boys in the Zuoz tournament in 2009. Weston also made the highest ever individual score in the club`s history finishing on 169*, thereby surpassing Van Dalsum’s 155*. It remains to be seen if this will challenge Van Dalsum out of retirement to make a new attempt. Punjab CC began their innings clearly shell shocked by what had happened to them and were quickly in trouble due to some very good, tight bowling from the six MCC bowlers used. 1 – 2, 2 – 2, 3 – 30, 4 – 45, 5 – 51, 6 – 58, 7 – 60, 8 – 60, 8 – 72 and 10 – 74. A resounding victory , MCC winning by 250 runs was celebrated at the Chinese tower. Weston, club record score. Due. MCC beat German champions by 5 wkts. 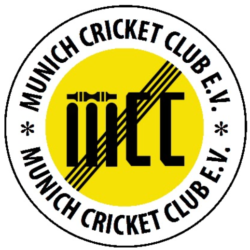 Mcc beat the German champs on their home patch ultimately by 5 wkts. A keen fielding performance aided by good all-round bowling on this high scoring ground. Sarma was the pick of the bowlers with a Michelle. A total of 155 was never going to be enough despite a few batsman throwing their wicket away. Weston was the backbone continuing his inspired early season form. MCC won a good game by 5 wkts. The visitors SSC won the toss and chose to bat on a stinking hot day in the English Garden. SSC posted a solid total of 178 with German opener Milan Fernando top scoring with 65 before being removed by a superb catch by Weston off Sear. Blades picked up another 4 sticks to his collection. In reply Lovell and Sarma put on 64 for the second wicket before the Kiwis Algar and Clare finished the job to see it through after a slight wobble. Batting first MCC recovered from 56-4 with Clare (55) and Rabbani (49) putting on a century partnership. Cap me. A total of 193 was always going to prove challenging. Scott making his seasonal debut was pick of the bowlers with 4-22. OMeagher, Garner and Blades also amongst the wickets as the visitors subsided to 92 all out. MCC lost by 5 runs. CCB won the toss and batted first and posted a challenging total of 215 with the skipper almost carrying his bat for 96 run out on the last ball of the innings. MCC subsided to 130-7 before Garner and Hobbs got to work to salvage the innings with a fine partnership of 69 for the 8th wkt. Mcc came close but no cigar falling short by five runs in the end. MCC lost on 20over rain rule in the league decider. MCC lost on 20over rain rule in a tight match in the English Garden. Winning the toss Mcc decided to bat first recovering from 57-5 with Clare top scoring ably supported by Rabbani. MCC disappointedly bowled out for 154 not using up the full allocation of overs. In reply some dross was bowled, catches went down at regular junctures but the visitors made heavy work of chasing an average total. The rain was coming, you could sense it. The visitors were 99-6 at one point but recovered well to 142 when the heavens were finally deemed to have done enough damage for the day. Rain..rain..rain..before celebrating Lovell’s 40th birthday.